The Tarot is an ancient system of divination, offering insights and guidance through symbols, ancient lore and hidden mystical meanings. A Tarot deck is made up of 78 cards, each having their own unique meanings and applications. 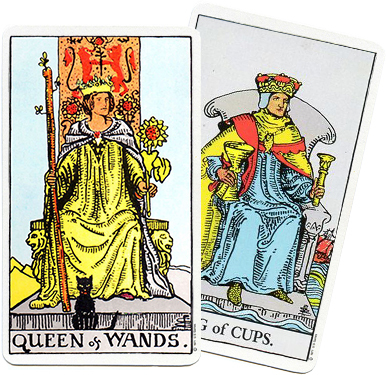 There are 22 Major Arcana cards, 40 Minor Arcana cards and 16 Court cards. I use three decks: the Aquarian, the Hanson-Roberts deck and occasionally the Universal Waite deck. All of these decks have their origin in the traditional Rider Waite deck. 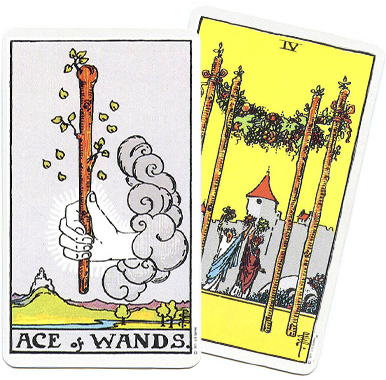 If you are going to have a reading with me, or have had one, I would like to suggest that you read the following so that you have a better idea of the Tarot and how it works. As I mentioned there are 78 cards in a Tarot deck. The deck is made up of three primary groupings. 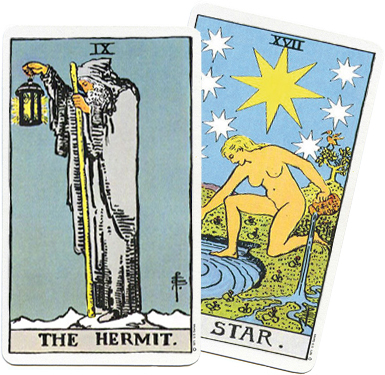 The Major Arcana cards are indicators of Universal forces at work in your life. They can be viewed as archetypal aspects of your own nature as you journey through your own evolutionary process. The Cosmic and mystical forces as symbolized in these 22 cards can offer you greater insights into your own process once you tune into them. There are four suits with an Ace through ten of each. Each suit rules a different aspect of life. Pentacles symbolize the earth element. It reveals information about the more practical including the mundane affairs of your life, your resources, finances, physical environment, work, career, home and other basic elements of your life. Pentacles correlate to the diamonds in a regular deck of cards. Cups symbolizes the water element. They reveal information about how your emotional life, you feel about things, what you care about, your relationships, what fulfills you and conversely what you feel sad or incomplete about in your life. Cups correlate to the hearts in a regular deck of cards. Swords correlates to the air element. It reveals information about your mentality, how you think, communicate, the decisions you’ve made that still influence you, your attitudes and fears and how you relate to them. Swords correlate to the spades in a regular deck of cards. Rods symbolizes the fire element. It reveals information about your spiritual life, morals, ethics and what you have a strong draw to or interest in. The rods rule what fuels you and represents your passion and enthusiasm for life. Rods correlate to the clubs in a regular deck of cards. Kings – a man of distinction and maturity. Often the Kings are someone who has information for you or can guide you through and advise you in a particular situation you are dealing with. Queens – a woman who knows who she is, what she wants and needs and how to get it. She epitomizes the feminine aspect of her suit. Knights – a person who is dynamic and in pursuit of the things in whatever suit he appears. It is the part of each of you that is generally fiery, motivated and enthusiastic. Pages – a young person involved with the issue. They are likely to be open and innocent. It also represents you at the beginning of a phase of activity. © 2018 by Elizabeth Jone. All rights reserved.